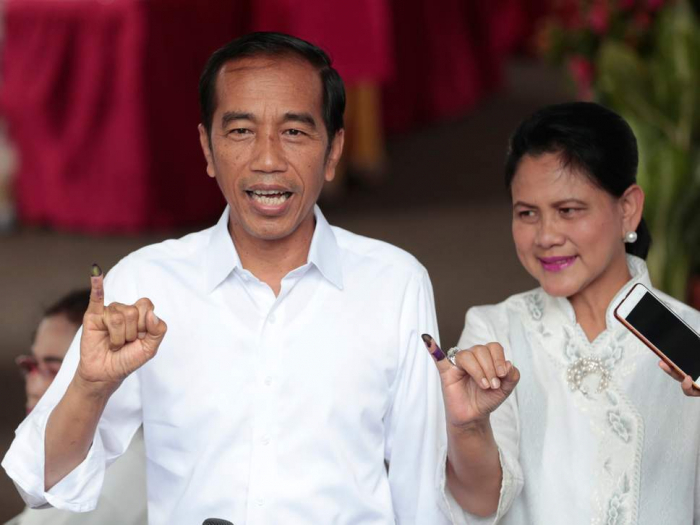 Incumbent president Joko Widodo is on course for victory in Indonesia's election, the first unofficial results show, with one count putting him 13 percentage points ahead of his rival. Another count, by the Kompas newspaper, gave Mr Jokowi 55.45 per cent to Mr Prabowo's 44.55 per cent. Indonesia's election body authorises these "quick counts" in lieu of exit polls, with official results taking many days to be confirmed. Produced by reputable news outlets and survey organisations, the early counts have proved reliable in past elections. Another two organisations also had Mr Jokowi on between 54 and 56 per cent. The crucial presidential race pitted Mr Jokowi, a former furniture salesman whose victory in 2014 was seen as finally breaking the hold on power of Indonesia’s deeply entrenched military and political elites, against Mr Prabowo, a self-styled strongman who cosied up to the country's powerful hardline Islamist factions in a bid to avoid a repeat of his 2014 failure. Asked to comment on the "quick count" results, Prabowo campaign spokesman Dahnil Anzar Simanjuntak said that numbers based on 50 per cent of votes was not enough.